Received this as a free gift. Taste is horrible. As someone said it is like paste with a horrible after taste. Don’t purchase. I'm glad I received this as free gift because it's disgusting. Was like eating protein paste! Immediately went in garbage. I’m very disappointed in the oatmeal. It had a weird texture & bad after taste, yuck. The oatmeal has much less flavor than the shakes, which was really disappointing to me. It's very bland, but it does its job of stemming my appetite in the mornings. I used to snack between breakfast and lunch, but I no longer need to do that thanks to this oatmeal. If they could improve the flavor, it'd be five stars. The oatmeal is delicious, but unfortunately the portions are way to small. Would you please consider making the portion size bigger , i really do love it ! Great taste. 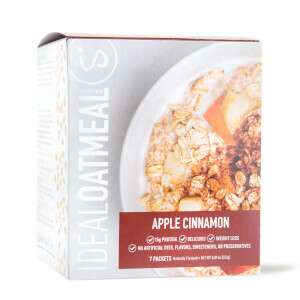 As I stated for the apple cinnamon one, this fills me right up with one package it taste great but would be even better with less of a whey protein taste. The consistency is not like regular oatmeal however I don't expect it to be since it is infused with other ingredients like a lot of protein. I like that it is healthy and fills me up for hours. I usually make 2 servings with almond milk and it keeps me from being hungry til lunch. The maple brown sugar flavor is good. The apple cinnamon is ok but not as good as the maple flavor.